Category: Slogans to Live By. Carry these reminders at all times. These practices don't require setting aside a separate substantial chunk of time -- but they will slow you down a bit (and that's a good thing.) Resolve to get stronger at living by these maxims, day by day. Sometimes make one of them the focus of your daily journaling. from Edwin Lynn, "The Sacred Moment" in Everyday Spiritual Practice, abridged and adapted. Life is precious. Every day is blessed, and I want to live that day fully. I can’t be fully focused on the present moment every waking moment, so I can create sacred moments. At these moments the preciousness of immediate experience and living-in-the-now unite. For example, I make a sacred moment each morning, when I stop at a small pond on my way to the office. To better remember each phase of these “S moments,” I use six words that begin with S.
1. SIGHT: I look out at the surrounding trees and distant shore. I try to notice new discoveries and to be aware of subtle daily changes in the blossoms, leaves, shadows, and colors. The water changes moment by moment, depending upon the wind and sun. Water is especially sensitive to light, and the breeze creates a ballet of changing reflections. Don’t just look. Let the sights sink in. Let them integrate in awareness with your other senses. When I visited Chartres Cathedral outside Paris, we arrived at 4:00; the church closed at 5:00. For the others in the group, this was no problem. They went inside, looked, walked around, and were in the gift shop well before 5:00. I couldn’t get enough of the building in that short time. I wanted to meditate on the mandala-like rose windows, luxuriate in the colors of the stained glass, marvel at the magnificence of the space, feel the roughness of the stone floors, and touch the soaring stone columns. For a deeper sense of being, I needed a more complete involvement of my senses. 2. SKY: Often, we see only what is at eye level, without being aware of the sky. Whether it is cloudy or bright, I find that when I am aware of the sky, I am more aware of the day. The sky gives context to the day and reminds us of our physical and spiritual presence in the world. 3. STANCE: As I look out at my surroundings and the sky, I become aware of my stance on the ground, my rootedness and connectedness with the earth. I feel this relationship through my legs and feet. Whether standing, sitting, or walking, I notice the ways that I am centered and grounded. 4. SMELL: Smell is the most fundamental of our senses, strongly associated with deep memories. When I returned to New England after a ten-year absence, it was not the landscape or the sky that I remembered most vividly, but the distinctive smell of the dampened leaves nestled in the woods. A delicate sniff can catch the subtle aromas of a pond’s misty moisture of natural flowers or of local vegetation. Attention to aroma heightens the reality of the moment. 5. SENSE: I say “sense” to refer to all the sensations other than sights, sounds, and smells: the feel of the temperature, the breeze, or if eating, the taste. Like most people, I used to pay little attention to the wind unless it was very brisk. As I have become more attuned to my senses, I find that most of the time there is a slight breeze, and when I’m particularly aware, I feel it on different parts of my face. Warmth and cold expand my sense of the moment. The feeling of warmth from the sun or the damp chill of penetrating cold is a part of the moment. 6. SOUND: Sound is the crucial focus of a sacred moment: listening is its theme and its essence. Listening keeps us in the moment so our minds don’t wander. The sacred moment intensifies and lengthens our time of seeing into a time of being. To reach a sacred moment, I find I need to look relatively straight ahead and not be distracted by any moving sights. I listen to the wind, the leaves, the water, and the birds. With these outer sounds, the chatter of my inner thoughts is kept from intruding upon the moment. If I am not listening, I know I am not in the experience, but still trapped in my head, thinking of the past or the future. 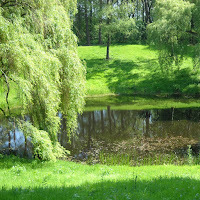 Standing at the pond, I see the landscape and sky, feel the ground and the breeze, and smell the water. Mostly I listen. My day includes other times for sacred moments. In the morning while showering, I don’t just get clean, but use the time to create a sacred moment. The sights are obviously limited, and I cannot see the sky, but stance, sense, and smell are particularly acute. Listening to the water as it splashes on my body throughout the shower is the key. It makes the shower more enjoyable. It also connects me to the larger waters of the pond, the ocean, and the skies. To make breakfast another sacred moment, I avoid watching television or reading the newspaper; I have time for those connections later. In the morning, I want to let my heightened awareness engage the glory of the day. I leave for the office a few minutes early to stop at the pond. The difficult part is allowing the extra time. It is very easy to rationalize that I don’t have the time. But I do stop, and I’m always glad I have. At the end of the day, I take the time to go for a walk. This is not just a walk for exercise, with the usual daydreaming; I apply the principles of the sacred moment to create a walking meditation. The sights and sounds are richer, though the distractions are more plentiful. I am especially aware of the sky and of the variation in smells from place to place—even of the wind changing direction along the way. Again: listening is key to staying in the moment. The preciousness of the day is enhanced in direct proportion to its number of sacred moments. Through sacred moments, we can quiet our mind’s inner chatter, and transform our experience of merely seeing into one of being.